During the reporting period, Israeli forces killed 2 Palestinian civilians in occupied East Jerusalem and wounded 16 civilians, including 5 children and 2 women; 3 of whom were wounded in occupied East Jerusalem, including a child and a woman. In the West Bank, in excessive use of force, on 30 October 2014, Israeli forces killed a Palestinian civilian in al-Thawri neighbourhood in East Jerusalem. They claimed that he attempted to assassinate Rabbi Yehuda Glick on the previous night. On 05 November 2014, in excessive use of force as well, Israeli forces killed a Palestinian civilian, who drove his van into a group of persons waiting at a light rail in al-Sheikh Jarrah neighbourhood, north of the Old City of East Jerusalem. As a result, an Israeli officer was killed and 13 others sustained various wounds. It should be noted that Israeli forces could wound the attacker and arrest him, especially as he was not armed. Israeli forces used excessive force against peaceful protests organised by Palestinian civilians, international and Israeli human rights defenders in protest at the construction of the annexation wall and settlement activities in the West Bank. As a result, a 12-year-old male sustained a bullet wound to the right leg and a 27-year-old male sustained a (toto) bullet wound to the right leg also during al-Nabi Saleh weekly protest, northwest of Ramallah. In the same context, 11 Palestinian civilians, including 3 children and an elderly woman, were wounded during other protests against attacks by the Israeli forces and settlers in al-Aqsa Mosque. On 30 October 2014, a 17-year-old male was hit by a gas canister to the head during a protest organized by dozens of school students near Attara checkpoint, north of Bir Zeit village, north of Ramallah. Moreover, on the same day, a 19-year-old male sustained a bullet wound to the left leg during a protest, east of Abween village, northwest of the city. On 31 October 2014, 6 civilians, including 3 children and an elderly woman were wounded during a protest around Qalandya checkpoint, north of occupied Jerusalem. On 02 November 2014, 3 civilians were wounded during a protest organized around Qalandya checkpoint too. In East Jerusalem, on 31 October 2014, a 43-year-old male sustained shrapnel wound to the head when Israeli forces raided the condolences tent of Mo'taz Hejazi in al-Thawri neighbourhood, east of East Jerusalem, and fired sound bombs and tear gas canisters at mourners in the tent. On 03 October 2014, Israeli special forces wounded headmistress of al-Mukabber Secondary School and a student when Israeli forces raided the school under the pretext of looking for "young men who threw stones at them and fled". During the reporting period, Israeli forces conducted at least 45 military incursions into Palestinian communities in the West Bank. During these incursions, Israeli forces arrested at least 50 Palestinians, including 10 children and 2 women. Thirty-five of these civilians, including 8 children and a woman, were arrested in East Jerusalem. In the Gaza Strip, Israeli forces arrested a child and a young man while attempting to sneak into Israel in search for work via the border fence, east of Johr al-Deek, in the central Gaza Strip. The illegal closure of the Gaza Strip, which has been steadily tightened since June 2007 has had a disastrous impact on the humanitarian and economic situation in the Gaza Strip. The Israeli authorities impose measures to undermine the freedom of trade, including the basic needs for the Gaza Strip population and the agricultural and industrial products to be exported. For 7 consecutive years, Israel has tightened the land and naval closure to isolate the Gaza Strip from the West Bank, including occupied Jerusalem, and other countries around the world. This resulted in grave violations of the economic, social and cultural rights and a deterioration of living conditions for 1.8 million people. The Israeli authorities have established Karm Abu Salem (Kerem Shaloum) as the sole crossing for imports and exports in order to exercise its control over the Gaza Strip’s economy. They also aim at imposing a complete ban on the Gaza Strip’s exports. During the reporting period, Israeli forces arrested a Palestinian patient who obtained a permit to travel to the West Bank for medical treatment, while another civilian accompanying his father was arrested while the father was denied travel for medical treatment. Israeli forces killed a Palestinian civilian in al-Thawri neighborhood, east of the Old City in Jerusalem. They claimed that the aforementioned shot at Rabbi Yehuda Glick the night before. Hundreds of Palestinians gathered at the entrance of Wadi al-Jouz neighborhood near al-Asbat Gate in the Old City in Jerusalem to organize a demonstration in protest and condemnation of the killing of Mutaz Hijazi. Israeli forces arrested Tawfiq Ibrahim al-Kherbawi (23) and took him to an unknown destination. Furthermore, Israeli forces raided a condolences tent for Mutaz Hijazi in al-Thouri neighborhood. They fired sound bombs and tear gas canisters at the people. As a result, Attya Shabanah (43) sustained shrapnel wounds after he was hit a sound bomb to his head. Israeli forces killed a Palestinian civilian when he stormed the light train station with his commercial car in Shimoun Street, in al-Sheikh Jarrah neighborhood, north of the Old City in Jerusalem, and ran over a group of people who were standing there. On30 October 2014, Israeli authorities closed all gates of the al-Aqsa Mosque for the first time since the city was occupied in 1967. Moreover, Israeli forces besieged the mosque and denied Palestinian worshippers access to it to perform their 5 daily prayers. Moreover, the employees of the Islamic Endowments (Waqef) in Jerusalem discovered a hole leading to al-Aqsa Mosque from a tomb in al-Rahma Gate cemetery. They discovered that an anonymous person or more tried to raid the mosque through the hole which was dug under an archeological site. In the context of a policy of destroying civilian’s homes, Israeli forces destroyed two houses belonging to Khalil Abu Rajab and Isam Abu Sbeih in Yasoul neighborhood in Silwan village, south of the Old City in Jerusalem. Moreover, an Israeli bulldozer destroyed a house under construction belonging to Hasan Shueib al-Hidra in the New Street area under the pretext of building in a “C” area according to Oslo Accords without a prior license from the Israeli authorities. During the reporting period, Israeli forces arrested 3 Palestinian civilians, including a woman and a child, in East Jerusalem. As part of the Israeli policies aiming to suppress protests against the Israeli practices in the city, in which children participate, on Sunday, 02 November 2014, the Israeli government approved a bill to impose additional penalties on Palestinian children, who throw stones at Israeli soldiers, mounting to 20-year imprisonment sentences. An Israeli settler deliberately ran down Yahya Ahmed Darwich (36) from al-Isawiah village, north of Jerusalem when he was riding his motorcycle in Street No. 1 near al-Sheikh Jarrah neighborhood. Moreover, another Israeli settler deliberately ran down Ali al-Sahwish (21) from the Old City in Jerusalem. On 30 October 2014, Israeli forces moved into al-Zghfan area in al-Shiukh village, northeast of Hebron. They stationed near al-Taqadum Company for Marble and confiscated a digging machine and a saw. They also confiscated a bulldozer belonging to Adnan Nimer Taqatqa under the pretext of building in a “C” area according to Oslo Accords without a prior license from the Israeli authorities. On 02 November 2014, Israeli forces backed by military vehicles and a vehicle belonging to the Construction and Organization Department in the Civil Administration moved into Atouf area, east of Tubas. They confiscated digging machines. Furthermore, Israeli forces backed by military vehicles and a vehicle belonging to the Construction and Organization Department in the Civil Administration and 3 GCB bulldozers moved into Khilat Abu Nakhla area in the southern side of Doura. They also moved into Kherbat Um al-Kheir, east of Yatta, south of Hebron. During the reporting period, Israeli soldiers used excessive force against peaceful demonstrations organized by Palestinian civilians, international and Israeli human rights defenders in protest at the construction of the annexation wall and settlement activities in the West Bank. As a result, 2 Palestinian civilians, including a child, were wounded during al-Nabi Saleh weekly protest, northwest of Ramallah. In the same context, 11 Palestinian civilians, including 3 children, were wounded during protests organized against the Israeli forces' and settlers' attacks in al-Aqsa mosque in Jerusalem. · Following the Friday Prayer on 31 October 2014, dozens of Palestinian civilians and international and Israeli human rights defenders organized a peaceful demonstration in Bil’in, west of Ramallah, in protest at the construction of the annexation wall and settlement activities. The demonstrators took the streets raising the Palestinian flags and headed to the liberated territories near the annexation wall. Early in the morning, Israeli forces closed all entrances to the city to prevent Palestinian civilians and international and Israeli human rights defenders from participating in the protests. The protestors marched by the annexation wall and tried to cross the fence. Israeli soldiers stationed behind the wall, in the western area, and a large number of soldiers deployed along it, fired live bullets, tear gas canisters, rubber-coated steel bullets, sound bombs and waste water at them and chased them into the olive fields. As a result, dozens of civilians suffered tear gas inhalation and others sustained bruises as they were beaten up by Israeli soldiers. · On the same day, dozens of Palestinian civilians organised a peaceful demonstration in the centre of Ni’lin village, west of Ramallah, in protest at the construction of the annexation wall and settlement activities. The demonstrators took the streets and headed to the annexation wall. Israeli forces closed the gates of the wall with barbwires and prevented the demonstrators from crossing to the land behind it before they responded by throwing stones. Israeli soldiers fired live ammunition, rubber-coated metal bullets, sound bombs and tear gas canisters at the civilians, and chased them into the village. As a result, many civilians suffered tear gas inhalation and sustained bruises as they were beaten up by Israeli soldiers. · Around the same time, dozens of Palestinian civilians and Israeli and international human rights defenders organised a peaceful demonstration in al-Nabi Saleh village, southwest of Ramallah, in protest at the construction of the annexation wall and settlement activities. Demonstrators made their way in the streets raising the Palestinian flags and chanting slogans against the occupation and in support of the Palestinian unity resistance, and then they headed to the lands that the settlers are trying to rob by force near “Halmish” settlement. Israeli forces had closed all the entrances of the village since the morning to prevent Palestinian and international activists and journalists from participating in the demonstration. When they arrived at the aforementioned land, demonstrators were met by live bullets, tear gas canisters, rubber-coated steel bullets, sound bombs and skunk water and were chased into the village. As a result, 12-year-old Mohammed Basem Mohammed Tamimi sustained a bullet's shrapnel wound to the right leg and a 27-year-old male sustained a (toto) bullet wound to the right leg too. He was taken to Yasser Arafat Hospital in Salfit for medical treatment. · Also at approximately 13:20, Palestinian civilians and international solidarity activists organized a protest in the center of Kufor Qaddoum village, northeast of Qalqilya, heading to the eastern entrance of the village in protest against closing that entrance since the beginning of al-Aqsa Intifada with an iron gate. The demonstrators threw stones at Israeli soldiers, who fired sound bombs and tear gas canisters in response. As a result, several protestors suffered tear gas inhalation. Moreover, Israeli forces sprayed skunk water at civilians and houses around and used bulldozers to gather stones in front of houses in the main road, but no further incidents were reported. · At approximately 11:00 on Saturday, 01 November 2014, Palestinian civilians and participants from the popular committee against the annexation wall and settlement activities in the southern West Bank made their way in the streets from Sourif village, northwest of Hebron, to al-Jab'a checkpoint, northwest of the city. Israeli forces arrived at the area and surrounded the protest. In the meantime, members of the popular committee damaged the metal gate and removed the cement cubes away from the road. In response, Israeli forces heavily fired gas canisters and harshly beat the participants, but no arrests were reported. · On Thursday afternoon, 30 October 2014, dozens of Palestinian school students gathered neat Attara checkpoint, north of Birzait village, north of Ramallah. They set fire to tires and threw stones and empty bottles at Israeli soldiers, who fired live ammunition, rubber-coated metal bullets, sound bombs and tear gas canisters in response. As a result, a 17-year-old male was hit by a gas canister to the head and many others suffered tear gas inhalation. · On Thursday afternoon, dozens of Palestinians youngsters gathered in the east of 'Abween village, northwest of Ramallah, overlooking street (60), and threw stones at the street. Due to which, Israeli forces deployed in the area fired live ammunition, rubber-coated metal bullets, sound bombs and tear gas canisters. As a result, a 19-year-old male sustained a bullet wound to the left leg and many others suffered tear gas inhalation. · Following the Friday prayer, on 31 October 2014, dozens of Palestinians gathered at the entrances of Qalandya refugee camp, north of occupied Jerusalem, to organize a protest at the Israeli forces' and settlers' attacks in al-Aqsa mosque. Israeli heavily armed forces were deployed in the area. The protestors set fire to tires and threw stones and empty bottles at Israeli soldiers, who fired live ammunition, rubber-coated metal bullets, sound bombs and tear gas canisters in response. As a result, 6 civilians, including 3 children and an elderly woman, were wounded. 63-year-old Zaina Ibrahim Yusef Jadallh was hit by a sound bomb to the left knee, while a 14-year-old male sustained a bullet wound to the left thigh, a 16-year-old male sustained a bullet wound to the abdomen causing holes in the intestines, a 17-year-old male sustained a bullet wound to the right leg, an 18-year-old male sustained 2 bullet wounds to the right and left ankles and a 23-year-old male sustained a bullet wound to the right eye. · On Friday afternoon, dozens of Palestinian civilians gathered at the western entrance of Selwad village, northeast of Ramallah, on Selwad-Yabroud road near street (60) to organize a protest against Israeli policies. The protestors set fire to tires and threw stones and empty bottles at Israeli soldiers, who fired live ammunition, rubber-coated metal bullets, sound bombs and tear gas canisters in response. As a result, a number of protestors suffered tear gas inhalation and others sustained bruises as they were beaten up by Israeli soldiers. Moreover, Israeli soldiers arrested Ali Dar Ali (29), a reporter of Palestine TV, and detained him for an hour near the military watchtower. He was then taken "Benjamin” police station, north of Jerusalem. At approximately 20:15, he was released from the Israeli military liaison office in "Beit Eil" camp and submitted to the Palestinian liaison office, but Israeli forces confiscated his press vest. · Also on Friday afternoon, dozens of Palestinian young men gathered from different areas in Ramallah and al-Bireh around Ofer detention facility, southwest of Ramallah, in protest at the Israeli practices in al-Aqsa mosque. They made their way towards the facility's gate, which was closed by Israeli soldiers. The protestors set fire to tires and threw stones and empty bottles at Israeli soldiers, who fired live ammunition, rubber-coated metal bullets, sound bombs and tear gas canisters in response. As a result, a number of protestors suffered tear gas inhalation and others sustained bruises as they were beaten up by Israeli soldiers. · At approximately 02:00, on the abovementioned day, dozens of Palestinians organized a protest at the western entrance of Taqou' village, southeast of Bethlehem, in protest at the Israeli measures to create Jewish majority in Jerusalem. The protestors threw stones and empty bottles at Israeli soldiers, who fired live ammunition, rubber-coated metal bullets, sound bombs and tear gas canisters in response. As a result, a number of protestors suffered tear gas inhalation. · At approximately 13:00 on Sunday, 02 November 2014, dozens of Palestinians and human rights activists gathered in front of Qalandya refugee camp, north of Jerusalem, in protest at the Israeli settlers' and forces' attacks in al-Aqsa mosque and marking the 97th anniversary of Balfour Declaration. They headed towards Qalandya checkpoint between Jerusalem and Ramallah, where Israeli heavily armed forces were deployed. The protestors set fire to tires and threw stones and empty bottles at Israeli soldiers, who fired live ammunition, rubber-coated metal bullets, sound bombs and tear gas canisters in response. As a result, 3 civilians were wounded: an 18-year-old male sustained a bullet wound to the left knee; an 18-year-old male sustained a bullet wound to the left knee too; and a 19-year-old male sustained a bullet wound to the right leg. For almost 6 consecutive years, Israeli forces have continued to prevent the delivery of construction materials to the Gaza Strip. Two years ago, Israeli forces approved the delivery of limited quantities of construction materials for a number of international organizations in the Gaza Strip. On 17 September 2013, they allowed the entry of limited quantities of construction materials for the private sector. However, on 13 October 2013, they re-banned it claiming that these materials are used for constructing tunnels. Last week, Israeli forces allowed the entry of construction materials only for UNRWA and UNDP projects. As a result, construction works have completely stopped impacting all sectors related to construction and an increase in unemployment levels. During the 51-day Israeli offensive on the Gaza Strip in July and August 2014, Israeli authorities did not allow the entry of any construction materials. As a result, vital and infrastructure projects have been obstructed so far. · Hebron: At approximately 07:00 on Thursday, 30 October 2014, Israeli forces established two checkpoint; the first one was at the northern entrance of Hebron and the second was at the entrance of Sa'ir village, east of the city. Later, the two checkpoints were removed and no arrests were reported. At approximately 07:30 on Friday, 31 October 2014, Israeli forces established a checkpoint at the entrance of Beit 'Awa village, south of Dura, southwest of the city. Later the checkpoint was removed and no arrests were reported. At approximately 07:30 on Saturday, 01 November 2014, Israeli forces established a checkpoint at the entrance of Beit 'Awa village, south of Dura, southwest of the city. Later the checkpoint was removed and no arrests were reported. At approximately 04:30 on Sunday, 02 November 2014, Israeli force established a checkpoint at the entrance of 'Aroub refugee camp, north of Hebron. The checkpoint was later removed, and no arrests were reported. At approximately 03:30 on Monday, 03 November 2014, Israeli forces established a checkpoint at the entrance of Taramah village, south of Dura, southwest of Hebron. The checkpoint was later removed , and no arrests were reported. At approximately 03:30 on Tuesday, 04 November 2014, Israeli forces established a checkpoint at the entrance of al-Tabaqah village, south of Dura, southwest of the city. The checkpoint was later removed, and no arrests were reported. At approximately 07:00 on Wednesday, 05 November 2014, Israeli forces established a checkpoint at the northern entrance of Hebron. The checkpoint was later removed, and no arrests were reported. · Ramallah: On Thursday dawn, 30 October 2014, Israeli forces established a checkpoint at the entrance of Nil’in village, west of the city. At approximately 18:30, another checkpoint was established under Kharbtha al-Misbah Bridge, southwest of the city. All checkpoints were removed. At approximately 10:30 on Friday, 31 October 2014, Israeli forces established a checkpoint at the entrance of al-Nabi Saleh village, south of the city. At approximately 18:00, another checkpoint was established at the intersection of Beit 'Oar al-Foqa village, southwest of Ramallah. At approximately 20:30, they established a similar checkpoint under the bridge of Yabrod village, northeast of Ramallah. All checkpoints were removed and no arrests were reported. · Jericho: At approximately 10:30 on Thursday, 30 October 2014, Israeli forces established a checkpoint at the entrance of Fasail viilage, north of the city. Later, the checkpoint was removed and no arrests were reported. At approximately 20:00 on Friday, 31 October 2014, Israeli forces established a checkpoint at the southern entrance of the city. The checkpoint was later removed and no arrests were reported. · Jenin: At approximately 12:30 on Thursday, 30 October 2014, Israeli forces established a checkpoint on the main road between Jenin , Tulkarm and Nablus near the intersecftion of 'Arrabah village, south of Jenin. Later, the checkpoint was removed and no arrests were reported. At approximately 19:30 on Friday, 31 October 2014, Israeli forces stationed at Barta'ah Checkpoint, which is established at the eastern entrance of Bart'ah village isolated from its surrounding due to the annexation wall, southwest of Jenin, closed the checkpoint under the pretext that a number of boys threw stones at the Israeli forces stationed at the checkpoint. Israeli forces later re-established their presence at the checkpoint and opened it again. It should be mentioned that the aforementioned checkpoint is the only passing point for the village residents with outside world. Therefore, if it was closed the village turns into a big prison. At approximately 17:00 on Tuesday, 04 November 2014, Israeli forces established a checkpoint at the entrance of Kfeiret village, southwest of Jenin. The checkpoint was later removed, and no arrests were reported. · Salfit: At approximately 22:30 on Saturday, 01 November 2014, Israeli forces established a checkpoint at the electronic entrance of Salfit near "Arayel" settlement established north of the aforementioned city. The checkpoint was later removed and no arrests were reported. At approximately 07:10 on Monday, 03 November 2014, Israeli forces established a checkpoint at the northern entrance of Salfit. At approximately 18:00, they established a similar checkpoint at the western entrance of Deir Istayyah village, northwest of the city. At approximately 22:00, Israeli forces established a checkpoint at the western entrance of Haris village, northwest of the city. No further incidents were reported. · Qalqilya: At approximately 16:10 on Thursday, 01 November 2014, Israeli forces established a checkpoint at the intersection of Jeet village, northeast of Qalqilya. They detained Rajaa'I Hamed Jaber Msalam and released him at approximately 16:50. No further incidents were reported. At approximately 09:00 on Saturday, 01 November 2014, Israeli forces established a checkpoint near Jeet village, northeast of Qalqilya. At approximately 11:00, the checkpoint was removed, and no arrests were reported. At approximately 16:00, another checkpoint was established between Jayous and 'Azoun villages, north of Qalqilya. At approximately 17:00, the checkpoint was removed, and no arrests were reported. At approximately 19:45, Israeli forces established a checkpoint at 'Azoun village entrance, east of Qalqilya. The checkpoint was removed, and no arrests were reported. · Tulkarm: At approximately 04:00 on Thursday, 30 October 2014, Israeli forces established a checkpoint on the main road between Tulakrm and Nablus near the intersection of Beit Leed village, east of Tulkarm. The checkpoint was later removed, and no arrests were reported. At approximately 19:00, Israeli forces stationed at 'Inab checkpoint, which is established on the main road between Tulkarm and Nablus, east of Tulkarm, tightened it restriction against Palestinian civilians and obstructed their movement. The tightening later was ended, and no arrests were reported. At approximately 17:00 on Friday, 31 October 2014, and at approximately 19:00 on Saturday, 01 November 2014, they re-tightened restrictions at the aforementioned checkpoint. At approximately 20:00 on Sunday, 02 November 2014, Israeli forces established a checkpoint on the main road between Tulkarm and Nablus near the intersection of Beit Leed village, east of Tulkarm. The checkpoint was later removed, and no arrests were reported. At approximately 17:00 on Tuesday, 04 November 2014, Israeli forces stationed at 'Inab checkpoint established on the main road between Tulkarm and Nablus, east of Tulkarm, tightened its restrictions against Palestinian civilians. The tightening later ended, and no arrests were reported. At approximately 07:00 on Wednesday, 05 November 2014, Israeli forces established a checkpoint on the main road between Tulkarm and Qalqilya near the eastern entrance of Jubarah village. The checkpoint was later removed, and no arrests were reported. It should be mentioned that Jubarah village has been isolated from its surrounding for 10 years since al-Aqsa Intifada due to the annexation wall, south of Tulkarm. However, lately the course of the wall was changed to be passing west of the village. As a result, the village was re-merged with the nearby villages. · At approximately 18:00 on Tuesday, 04 November 2014, Israeli forces established a checkpoint on the main road between Tulkarm, Nablus and Jenin near the intersection of 'Arrabah village, south of Jenin. When a car, in which Feras 'Ali Hussein Sharidah (24) from 'Arrabah village, south of Jenin, was passing through the checkpoint, they forced him to get out of the car. He was then arrested and taken to an unknown destination. The checkpoint was later removed, and no further incidents were reported. · On Thursday, 30 October 2014, Israeli forces killed a Palestinian civilian in al-Thawri neighborhood, east of the Old City in Jerusalem. They claimed that the aforementioned shot at Rabbi Yehuda Glick the night before. According to investigations conducted by PCHR, on the aforementioned day, Israeli forces moved in al-Thouri neighborhood and surrounded the area. They went up the roofs of houses next to that of Mutaz Ibrahim Hijazi (32) and opened fire at him on the roof of his house. As a result, he was hit by 20 bullet wounds. They then threw the solar panel over his body to make sure he’s dead. Muhammad Mahmoud, lawyer for al-Damir Association for Human rights, said that the judge of the Magistrate Court issued a decision to hand the victim's body to his family after it was held by Israeli soldier. He was buried in al-Sahera Gate cemetery. · Following the Friday prayer of 31 October 2014, hundreds of Palestinians gathered at the entrance of Wadi al-Jouz neighborhood near al-Asbat Gate in the Old City in Jerusalem to organize a demonstration in protest and condemnation of the killing of Mutaz Hijazi. When the demonstration arrived at al-Maqdisi Street, Israeli forces fired tear gas canisters and rubber-coated metal bullets to disperse them. As a result, many civilians suffered tear gas inhalation. Furthermore, Israeli forces arrested Tawfiq Ibrahim al-Kherbawi (23) and took him to an unknown destination. · At approximately 17:00, Israeli forces raided a condolences tent for Mutaz Hijazi in al-Thouri neighborhood. They fired sound bombs and tear gas canisters at the people. Later, Palestinian youths threw stones at Israeli soldiers so they open fire in response. As a result, Attya Shabanah (43) sustained shrapnel wounds after he was hit a sound bomb to his head. · On Wednesday, 05 November 2014, Israeli forces killed a Palestinian civilian after he raided the light train station with his commercial car in Shimoun Street, in al-Sheikh Jarrah neighborhood, north of the Old City in Jerusalem, and ran down a group of people who were standing there. He was shot form a short distance and was killed on the spot. According to investigations conducted by PCHR, at approximately 13:00, Ibrahim Muhammad Dawoud Akkari (48) raided the light train station with his white Ford Transit car and ran down a number of people standing there. He then got off his car and started beating up the people who were passing there. Immediately, Israeli border guards opened fire and killed him. The accident resulted in the killing of an Israeli officer and the wounding of 13 others. · At approximately 06:00 on Thursday, 30 October 2014, Israeli authorities closed all gates of the al-Aqsa Mosque for the first time since the city was occupied in 1967. Moreover, Israeli forces besieged the mosque and denied Palestinian worshippers access to it to perform their 5 daily prayers. According to investigations conducted by PCHR and statements of eyewitnesses, on the abovementioned day, Israeli forces closed all gates of the al-Aqsa Mosque for worshippers from all ages, erected checkpoints and deployed troops around. Moreover, Israeli forces denied even students of al-Aqsa Shari'a Schools access to their school inside (about 500 male and female students), and denied muezzins and Imams access to the mosque. Only 8 persons, including Omar al-Kiswani, director of Al-Aqsa Mosque, and some guards were able to get into the mosque. On the following day, 31 October 2014, thousands of Palestinian worshippers performed the Friday prayer in the city streets, as males aged less than 50 were denied access to the mosque for prayer. It should be noted that Friday was the fourth consecutive Friday that young men were denied access to the mosque. According to estimates of Mr. al-Kiswani, the number of those who performed the Friday prayer in the mosque did not exceed 4,000 worshippers, and they were all elderly men and women. Furthermore, Israeli forces closed the gates of the mosque for students at al-Aqsa school for two consecutive days, arrested Hanadi al-Helwani (31) on Sunday, 02 November 2014, and attacked and arrested Abdul Rahman Sharif (34), a guard of the mosque. · At approximately 14:00 on Tuesday, 04 November 2014, the employees of the Islamic Endowments (Waqef) in Jerusalem discovered a hole leading to al-Aqsa Mosque from a tomb in al-Rahma gate cemetery. They discovered that an anonymous person or more tried to raid the mosque through the hole which was dug under an archeological site. · At approximately 06:00 on Tuesday, 04 November 2014, Israeli forces destroyed two houses belonging to Khalil Abu Rajab and Isam Abu Sbeih in Yasoul neighborhood in Silwan village, south of the Old City in Jerusalem. Abu Sbeih told PCHR that he moved with his family of 5 persons to live in his house recently. He finished preparing the first floor a week ago. He said the first floor had 3 furnished rooms while the second floor was still under construction. Abu Rajab added that he built his house 5 months ago and he lives with his family (8 persons) and his mother on the first floor. The second floor of the house belongs to his brother Ahmed. Israeli forces forcefully kicked his family out of the house and did not give them a chance to evacuate their belongings. · At approximately 07:00 on Wednesday, 05 November 2014, Israeli bulldozer destroyed a house under construction belonging to Hasan Shueib al-Hidra in the New Street area under the pretext of building in a “C” area according to Oslo Accords without a prior license from the Israeli authorities. Al-Hidra told PCHR that Israeli Special Forces and bulldozers raided al-Tour neighborhood and destroyed his house which was under constructed since 4 moths. Al-Hidra mentioned that the destruction of his house was not preceded by a warning or a destruction notice. · At approximately 16:00 on Thursday, 30 October 2014, Israeli forces moved into a house belonging to Musa al-Qadi in the African neighborhood, which is close to the walls of al-Aqsa mosque. They arrested his son Habib (21) after beating him up then took him to an unknown destination. · At approximately 14:00 on the aforementioned day, Israeli forces moved into a house belonging to Tawfiq Abul Hawa in al-Tour neighborhood in the Old City in Jerusalem. They arrested his son Naser (18) and took him to an unknown distention. · At approximately 19:00 on the aforementioned day, Israeli forces moved into a house belonging to Muhammed Ramadi in al-Sheikh Jarrah neighborhood in the Old City in Jerusalem. They arrested his son Majed (19) and took him to an unknown distention. · At approximately 19:00 on the aforementioned day, Israeli forces moved into a building belonging to Jaber al-Yasini in Silwan village, south of Jerusalem, claiming they were searching for the stone throwers. They tried to arrest two children: one is two years old and the other is nine. After searching, it turned out that Mimati Asad Jaber was with his mother on the roof of their house and accidently dropped a stone when Israeli soldiers were in the area. The child’s father said that the grandfather and the mother were in the house during the raid and one of the soldiers told the grandfather that they should raise their children not to throw stones. He added that they searched his child Izz al-Dein al-Qassam Haber (9) after knowing his name and tried to arrest him claiming he had colored stones in his pocket. After searching him, it turned out that the colored stones were actually candy. · At approximately 16:00 on Saturday, 01 November 2014, Israeli forced arrested Yazan Muhammad al-Razem when he was in al-Amoud gate in the Old City in Jerusalem after beating him up and took him to the investigation center in Salah al-Dein Street. · At approximately 20:00 on the aforementioned day, Israeli forces moved into a house belonging to Ahmed al-Bahar in Wadi al-Jouz neighborhood in the Old City in Jerusalem. They arrested his son Yousif (15). · At approximately 23:00, Israeli forces moved into al-Thouri neighborhood and raided and searched a number of houses. They arrested 4 civilians, including a child, and took them to an unknown destination. The arrested civilians were identified as: Tareq Mahmoud Sulaiman (19); Iyad Nouh Edkeik (22); Hamza Hijazi (21); and Suhaib Yousif al-Rajbi (16). · At approximately 05:00 on Sunday, 02 November 2014, Israeli forces moved into al-Iswaia village and raided and searched a number of houses. They arrested 3 civilians, including a child, and took them to an unknown destination. The arrested civilians were identified as: Ahmed Atef Obeid (19); Shaker Mustafa (22); and Ali al-Karki (22). · At approximately 11:30, Monday, 03 November 2014, Israeli forces moved into Jabal al-Mukabber Girls high school in Jabal al-Mukaber village, southeast of Jerusalem. They attacked the teachers and headmistress and the students. According to eyewitness testimonies, Israeli Special forces moved into the area two times within minutes. The first time was under the pretext of looking for boys who threw stones at the school and ran towards it. Israeli forces left the school after not finding the boys, however, the officer told them to move into it back again. During the second time, they threw sound bombs and tear gas canisters. As a result, Dima Eliyan the headmistress and one of the students sustained shrapnel wounds. Moreover, 3 students suffered tear gas inhalation. · At approximately 16:00 on the aforementioned day, Israeli forces moved into a house belonging to Walid Dandash in Ras al-Amoud neighborhood in the Old City in Jerusalem. They arrested his son Muath (16) and took him to an unknown distention. · At approximately 19:00 on the aforementioned day, Israeli forces moved into a house belonging to Muahmmed Ghannam (29) in Silwan village. They arrested him and took him to an unknown distention. · At approximately 15:00, Israeli forces arrested two children near their houses in al-Wad neighborhood in the Old City in Jerusalem then took them to al-Qishla investigation center. They were identified as: Abdullah Isamil Abu Sulb (11) and Muahmmed Ibrahim Asila (12). · At approximately 05:00 on Tuesday, 05 November 2014, Israeli forces moved into al-Thouri neighborhood, east of the Old City in Jerusalem. They raided and searched a number of houses and arrested 13 persons, including a child: Kathem Anous (16); Fadi Abu Sbeih; Sualiman al-Sayyad; Yousif Dari; Ayyoub Abu al-Hawa; Mahmoud Shweiki; Badi Ghaith; Muahmmed Joulani; Yousif Eskafi; Mahmoud Obeid; Mahmoud al-Jayyar; Muath Jayyar; Muath al-Rqazem; and Alaa al-Razem. · At approximately 19:00 on the aforementioned day, Israeli forces moved into a house belonging to Muhammed al-Qaq in Silwan village. They arrested his son Fuad (18). · At approximately 19:00 on the aforementioned day, Israeli forces moved into Wadi al-Jouz neighborhood and raided and searched a number of houses. They arrested 3 civilians, including a child, and took them to an unknown destination. The arrested were identified as: Mutaz Akram al-Kilghasi (17); Muahmmed Naser Abu Dalou (19); and Zakaryya Amin Hirbawi (22). · As part of the Israeli policies aiming to suppress protests against the Israeli practices in the city, in which children participate, on Sunday, 02 November 2014, the Israeli government approved a bill to impose additional penalties on Palestinian children, who throw stones at Israeli soldiers, mounting to 20-year imprisonment sentences. Office of Prime Minister Benjamin Netanyahu stated that the government approved the amendment of the bill in its weekly meeting. This amendment is supposed to be discussed at the Knesset to be approved. According to the statement, "New items will be added to the Penal Code in a way allowing the imposition of penalties mounting to 20 years of imprisonment for those who throw stones or objects at vehicles". · At approximately 18:30 on Friday 17 October 2014, Israeli settlers attacked Faisal Muhammad Azzam (20) in “Reinim Shalom” hotel after he tried to defend a colleague of his when she was attacked for wearing a head cover. 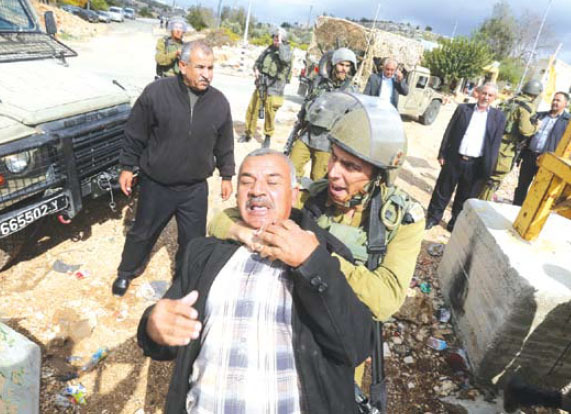 Azzam told PCHR that 11 settlers attacked his Palestinian colleague for wearing head cover. They verbally abused her and when he tried to defend her, they attacked him. He sustained bruises and was taken to “Shaare Zedek” for treatment. · At approximately 02:00 on Monday, 20 October 2014, Israeli settlers took over two residential buildings and a land in the central neighborhood in Silwan, south of the Old City in Jerusalem. The buildings are made up of 10 apartments belonging to Salah al-Rahbi and the other to Omran al-Qawasmi. Each building is made up of 3 floors. The families sold their estates to a civilian who was accused of selling the two buildings to colonist organizations. The land which is located near al-Rajbi building has an area of 700 square meters and was sold for the same person who deals with colonist organizations. · At approximately 16:00 on Friday, 31 October 2014, an Israeli settler deliberately ran down Yahya Ahmed Darwich (36) from al-Isawiah village, north of Jerusalem when he was riding his motorcycle in Street No. 1 near al-Sheikh Jarrah neighborhood. The aforementioned civilian was moved to Hadasha Ain Karem hospital for treatment. · At approximately 19:00 on the aforementioned day, an Israeli settler deliberately ran down Ali al-Sahwish (21) from the Old City in Jerusalem. The aforementioned was moved to Hadasha Ain Karem hospital for treatment. · At approximately 09:00 on Thursday, 30 October 2014, Israeli forces backed by military vehicles and a vehicle belonging to the Construction and Organization Department in the Civil Administration moved into al-Zghfan area in al-Shiukh village, northeast of Hebron. They stationed near al-Taqadum Company for Marble and confiscated a digging machine and a saw. They also confiscated a bulldozer belonging to Adnan Nimer Taqatqa under the pretext of building in a “C” area according to Oslo Accords without a prior license from the Israeli authorities. · At approximately 11:30 on Sunday, 02 November 2014, Israeli forces backed by military vehicles and a vehicle belonging to the Construction and Organization Department in the Civil Administration moved into Atouf area, east of Tubas. They confiscated a digging machine carrying a Palestinian license of (6019939) belonging to al-Taimaa Company for Construction. The digging machine was confiscated during repair works on a bridge that was destroyed during the previous day rainfall in al-Baqia area without declaring the reasons calling for this procedure. - Two bridges and a water network funded by the Palestinian Hydrology Association. It should be noted that the houses which were destroyed date back to over 100 years and were rebuilt three times since 19 April 2014 till today. In 29 September 2014, Israeli forces destroyed the power network to force the residents to evacuate the area in order to facilitate the expansion of “Etimar” settlement. · At approximately 09:00 on the aforementioned day, Israeli forces backed by military vehicles and a vehicle belonging to the Construction and Organization Department in the Civil Administration and 3 GCB bulldozers moved into Khilat Abu Nakhla area in the southern side of Doura. They bulldozed an agricultural land in which more than 70 olive and almond trees are grown and destroyed the walls that surrounded it. The land belongs to Yasser Abdel Minim Abdel Rahman al-Fakhouri (54) and his brother Naser (50). Israeli claimed they were part of Absentees' property. · At approximately 09:00 on Wednesday, 05 November 2014, Israeli forces backed by military vehicles and a vehicle belonging to the Construction and Organization Department in the Civil Administration moved into Kherbat Um al-Kheir, east of Yatta, south of Hebron. They deployed and destroyed two tents then confiscated them. It should be noted that the two tents were presented by the Red Cross to the residents of the area after their houses had been demolished several days earlier.